New Gyro Loaded Curly Fries takes an order of the chain's signature seasoned curly fries and tops them with sliced gyro meat, tzatziki sauce, gyro seasoning, red onions, and diced tomato. The Greek Gyro Salad consists of gyro meat, tzatziki sauce, gyro seasoning, red onions, and diced tomato on a bed of chopped iceberg and leaf lettuce. The Traditional Greek Gyro features gyro meat, tzatziki sauce, gyro seasoning, red onions, tomato, and shredded iceberg lettuce folded in a warm flatbread. You can find my review of it here. 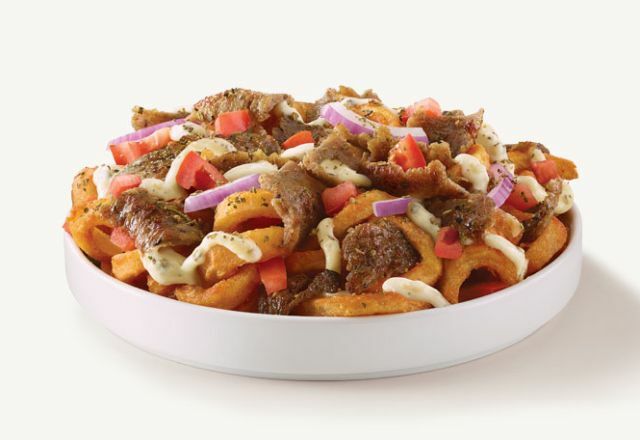 Basically, gyro meat, tzatziki sauce, and gyro seasoning is back at Arby's for a limited time and you can choose to have them either in a flatbread or on a salad or fries.